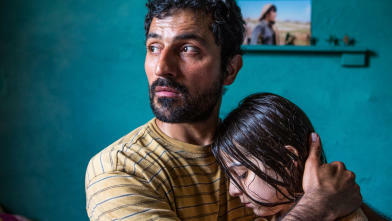 Zagros, the feature film debut of Kurdish-Belgian director Sahim Omar Kalifa, is full of contrasts: Kurdistan versus Brussels, man versus woman, the political versus the personal and autobiography versus ‘exactly the opposite’. They both came to Belgium illegally, they both came in the back of a truck and they’re both Kurdish. But despite these commonalities, filmmaker Sahim Omar Kalifa and his titular character Zagros are miles apart. For Kalifa, arriving in Belgium felt like arriving in a warm home, but to shepherd Zagros, who was used to a tranquil countryside life and the vast nature of Kurdistan, Brussels remains cold. Zagros made the move for the sake of his beloved wife Havin, who has had to flee the village after accusations of adultery. Can he resist the demands of family honour and jealousy pressuring him to revenge Havin? An interview with filmmaker Kalifa in four contrasts. Kalifa: “There are several reasons the story leads to Brussels. After being accused of adultery, Havin first seeks refuge in Istanbul, but the threat is still too present there. She decides to put Zagros’s love to the test: if he follows her to Brussels, their love will prevail. Besides, for me it was all about the contrast for Zagros. Turkish Kurdistan is like paradise to him; he cherishes every moment there. He knows Brussels could be hell, but he loves his wife and wants to support her. We emphasised this idea in post-production by using warm and overexposed shots for scenes in Kurdistan and grey, dark and rainy scenes in Brussels. The weather is a weight on Zagros’s psyche as well, as are his pressuring family and work-related stress. “I don’t want to make purely autobiographical films, but they are always close to my own experience. Like Zagros, I came to Belgium illegally in the back of a truck. And the female guerrilla soldiers I know first-hand, too. In 1991 – I was eleven years old – the Iraqi government retreated from Kurdistan. Our village was in Iraqi Kurdistan, just ten minutes away from Turkish Kurdistan. It was a conservative atmosphere, women didn’t do much besides cooking and cleaning. And then one day, armed female militia appeared. It was like a UFO from a different planet had landed in our village. It inspired me. Those women have changed a lot. They encouraged the women in our village to claim a more influential position, going against century-old traditions. You see the same pattern in Syrian Kurdistan, where female Kurdish soldiers have defeated Isis. Zagros had its Dutch premiere at IFFR 2018 and is screening in Dutch cinemas from 28 June 2018.